If you are a gardener in an area with cold winters, you will know that most plants do not grow over the winter and survive the conditions in a dormant state. The first cold snap will kill off flowering annuals, which then overwinter as seeds. Early growth in the spring will be destroyed by a late frost and so careful gardeners will cover the emerging shoots of their early potatoes with earth to protect them. Plants are subjected to chilling stress at temperatures in the range 0-15 °C and to freezing (frost) stress at temperatures below 0°C. The responses of plants to low temperatures are perhaps harder to categorise than those of animals. Parts of the plant are protected below ground and plants can lose large parts of their structure but survive and recover. Plants suffer not just because of the low temperatures themselves but also because of associated problems with the availability of water, nutrients and oxygen. There is great variety in the ability of plants to tolerate low temperatures, reflecting the temperature environment of their natural habitat. Tropical and subtropical plants, including crops such as maize, soybean, tomatoes and cucumbers, suffer cold stress at temperatures below 15 °C. Even though I have a greenhouse, my tomatoes have not done well this year because of a relatively cool summer. 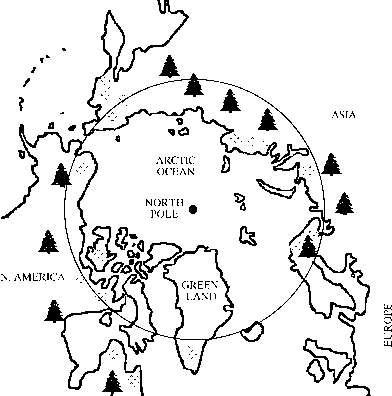 Many plants, however, grow successfully in cold northern temperate conditions and in alpine and arctic tundra. How do they survive the winter when air temperatures can sometimes fall as low as -60°C? The roots and parts of the plant below ground, or covered by snow or leaf litter, are insulated to a large extent from freezing. The plant may have its own insulation in the form of a downy or woolly covering, a dense mass of dead attached leaves or a thick bark. The large mass of some plants allows them to store heat absorbed during the day and prevent freezing at night. The plant may have ways to increase heat absorption from the environment, such as a rosette form in the leaves and flowers. Some plants protect their sensitive parts by accumulating water, which takes a long time to freeze, so that the temperature is held close to 0 °C for much of a short freezing event. The plant may lose, or not grow, its more sensitive tissues (young shoots, leaves and flowers) during the winter or it may die back almost completely and overwinter as a dormant seed, bulb, tuber, corm or rhizome. Some plants even show a degree of endothermy, generating heat from metabolic activity. For example, the skunk cabbage (Symplocarpus foetidus) of North America can maintain the temperature of its flowers at 10°C, even though the air temperature may be —15 °C, by increasing its rate of respiration. This plant is the earliest flowerer in the midwestern and northeastern USA, often pushing its large and foul-smelling flowers above the snow. Its elevated temperatures help it to attract insect pollinators. Despite these various strategies, many plants spend the winter with parts of their structure above the ground and exposed to temperatures that could fall to many degrees below 0 °C. The survival mechanisms of plants are similar to those of animals. They are either freezing tolerant or they avoid freezing by supercooling. However, because they usually contain a large quantity of water and are in direct contact with frozen soil or frost, which causes inoculative freezing, extensive supercooling is rare in plants and most survive by tolerating ice forming within them. Many plants are able to supercool and survive a brief exposure to temperatures just a few degrees below the melting point of their tissues. More extensive supercooling is, however, rare. The leaves of some evergreen plants have relatively little space between their cells, containing small volumes of water that are isolated from one another by leaf veins. This allows them to supercool to below — 20 °C. In winter, the most sensitive tissue of the twigs of apple trees, the parenchymal cells of the xylem (water-conducting tissue), can supercool to — 40 °C but die when they freeze. The stem tissues of temperate deciduous woody angiosperms (like the apple twigs) contain little space between the cells and so, if freezing takes place, it occurs within the cells - thus killing them. They therefore have to supercool to survive. Plants tolerate ice forming in parts of their structures as long as their cells do not freeze. The ice may form in the extracellular spaces between the cells. This raises the osmotic concentration of the unfrozen portion by the freeze concentration effect (see Figure 5.1), which in turn results in water being drawn from the plant's cells, partly dehy drating them and preventing them from freezing. This can occur since the membrane and wall of the plant cell prevent the ice outside the cell from seeding the freezing of the contents. Some plant tissues, such as the buds of leaves and flowers, enclose substantial spaces that lie outside the actual plant tissue. Ice forming in these spaces (extratissue or extraorgan freezing) results in water being withdrawn from the plant tissues themselves. Dehydration of the plant tissue occurs because the vapour pressure of the water within the tissue is higher than that of the adjacent ice. This partial dehydration prevents the plant tissue from freezing. This process occurs in the overwintering flower buds of rhododendrons, which are natives of cold mountain regions of North America and Asia - such as the Himalayas, for example. It is somewhat similar to the 'protective dehydration mechanism' of cold hardiness that is found in earthworm cocoons and some springtails. The large mass of plants means that they take a long time to freeze, and a slow rate of freezing is an important part of their ability to survive. The seeds, and some other tissues, of many plants have very low water contents in their dormant state. They may be anhydrobiotic or the little water that is present cannot freeze. They can thus survive to very low temperatures since there is no freezable water. At low water contents, and particularly when there are high concentrations of sugars, cells may be able to survive very low temperatures by their intracellular water vitrifying. In this state, the water forms a glass-like solid without forming ice crystals. The cold and frost tolerance of many plants changes with the season as a result of biochemical and physiological changes induced by the onset of winter. However, winter also represents a period of dormancy for the plant and it may be difficult to disentangle changes that are associated with dormancy from those directly responsible for the survival of low temperatures. The plant stores food to survive the winter and for the resumption of growth in the spring. Some of the food stores, such as sugars, may also be acting as cryoprotectants. Dormancy is triggered by changes in day length, as the days shorten during autumn, but low temperatures may also trigger cold hardiness more directly. The changes that occur during cold hardening are triggered by the production of abscisic acid. This plant hormone is involved in the response to other environmental stresses, such as desiccation. Membrane lipids can solidify at low temperatures, disrupting the physiological function of the membrane. The temperature at which the membrane changes from a fluid to a solid or gel state depends on its lipid composition. Cold hardening of plants involves an increase in the proportion of unsaturated fatty acids in the membranes. Since unsatu-rated fatty acids are more fluid than saturated fatty acids, this enables their membranes to remain functional to much lower temperatures. Many plants accumulate sugars (particularly sucrose, but also glucose and fructose) and sugar alcohols (such as sorbitol and mannitol) during winter. These may act as cryoprotectants, as they do in animals, but they also act as food stores. Trehalose is not generally found in plants, but sucrose plays a similar role by binding to membranes and proteins, protecting them against dehydration. A number of proteins are synthesised in response to low temperatures by cold-hardy plants. Some of these have been shown to play a role in preventing freezing damage. Several of the proteins induced by low temperatures are related to the dehydrins, produced in response to desiccation stress, and to the late embryogenesis-abundant proteins of seeds (see Chapter 3). This is perhaps not surprising since a major stress resulting from extracellular freezing is the dehydration of cells and their membranes. Some of the proteins that are induced by cold stress have been shown to have cryoprotective effects in assays which test their ability to preserve membrane function during freezing. The production of molecular chaperones, or heat shock proteins, in response to cold may be involved in stabilising proteins at low temperatures. Antifreeze proteins have been isolated from carrots and winter rye. They appear to control the size and shape of ice crystals forming in the plants, preventing them from damaging cells. They also affect the stability of the ice by inhibiting recrystallisation. These proteins are located in the outer cell layers and intercellular spaces of the plants. They are thus likely to interact both with ice coming into contact with the surface of the plant and with that forming within its intercellular spaces. This suggests that they may play a role in modifying the growth of ice crystals in the plant. microorganisms and low temperatures Since they are smaller and simpler than most plants or animals, microorganisms are more at the mercy of the conditions which surround them. When the temperature of their environment falls, they are directly exposed to the stresses associated with the cold and freezing. Microbiologists distinguish between microorganisms which are cold adapted, with an optimum growth temperature of 15°C or lower (psychrophiles), and those which are cold tolerant, with normal optimum growth temperatures (20-40 °C) but tolerating low temperatures and even growing slowly at 0°C (psychrotolerant). There are, of course, many more psychrotolerant than psychrophilic microorganisms since the metabolic machinery and structural components of the latter need to be adapted to work at low temperatures. Psychrophilic organisms, however, can only grow when there is liquid water present and growth will cease once their habitat freezes. Soil water is likely to freeze just below 0°C and seawater freezes at about —1.9 °C. Unfrozen pockets may remain, however, and microorganisms are able to grow within these to much lower temperatures. Although microorganisms can not grow when the water surrounding them freezes, many survive and can resume growth when the water melts again. Many different types of psychrotolerant microorganisms can be isolated from warm temperate soils, but psychrophiles tend to be absent since they can not compete with microbes which can grow better than them at warmer temperatures. There are, however, many environments that are frequently or permanently cold, favouring the presence of psychrophiles (see Chapter 2). Nearly three-quarters of the Earth is covered by deep oceans. Microorganisms living in deep ocean sediments experience conditions that are permanently cold (1-3 °C), as well as at high pressure (see Chapter 6). Almost constantly cold conditions are also present in polar regions and at high altitudes, associated with glaciers and permanent snow. In less extreme situations, the organisms may be exposed to low temperatures on a daily or seasonal basis with a corresponding change in the balance between conditions favouring the growth of psychrophiles and those favouring the growth of non-psychrophiles. Despite the cold conditions, however, Antarctic soil and aquatic habitats contain more psychrotolerant than psychro-philic microorganisms. It may be easier to tolerate the cold and wait for warmer conditions than to become adapted to growing at low temperatures. A wide variety of microorganisms are found in cold environments, including bacteria, archaea, fungi (and yeasts), single-celled algae and protists. They are found in soil, the sea, lakes, streams and associated with plants and animals. Psychrophilic microorganisms have a number of adaptations that enable them to function at low temperatures. An increased proportion of unsaturated fatty acids, and other changes in lipid composition, enables their membranes to remain fluid and retain their physiological function. The enzymes of psychrophiles work best at low temperatures. This appears to be a result of changes in their structure that makes them more flexible in the cold, allowing them to continue to catalyse biological reactions. The structural proteins of psychrophiles, such as those that comprise the microtubule scaffolding of cells in eukaryotes (tubulin), are also stable at low temperatures. A sudden decrease in temperature (cold shock) or continual growth at low temperatures (cold acclimation) stimulates the production of specific proteins. The cold shock response involves the production of stress proteins, in a similar fashion to the heat shock proteins produced in response to exposure to high temperatures (see Chapter 4). Cold shock proteins may play a similar role in removing cold-damaged proteins and acting as molecular chaperones, which assist the correct formation of other proteins in cells. The function of proteins produced in response to cold acclimation is less clear but they may play some cryo-protective role. As well as coping with the cold itself, microorganisms may have to tolerate the freezing of their surroundings. This is likely to occur in terrestrial polar habitats, temperate soils during winter, and in sea ice, snow and glaciers. Microorganisms even persist in permanently frozen soils (permafrost) and they have been isolated from Siberian permafrost from a depth of 400-900 metres, the soil of which dates from the second half of the Pliocene (3-5 million years ago). The microorganisms found in permafrost were living in the soil, or were blown there by the wind, before it froze and reflect the climate of the region when conditions were more temperate. This explains why more psychrotolerant than psychrophilic microorganisms can be isolated from permafrost. They have survived for such a long time in a state of cryptobiosis. Since microorganisms are mainly single celled, there can be no ice formed within them unless they freeze intracellularly. There are a few reports of microorganisms surviving intracellular freezing, but it is generally thought that the cell wall and plasma membrane prevent external ice from seeding their freezing. The formation of ice in the soil, or other medium, surrounding them will raise the concentration of salts, creating an osmotic gradient that dehydrates the cells. It is this dehydration that is the major stress for microorganisms during the freezing of their surroundings. Their survival is thus assisted by a slow rate of freezing, allowing them to adjust to the resulting dehydration. The thermal inertia of a large bulk of soil, or even rock, means that it is likely to take a long time to freeze. Some microbes produce sheaths or coats of mucus (extracellular polysaccharides), which may prevent immediate contact between their cells and ice in their environment. Antarctic yeasts and algae accumulate polyols and sugars which may be acting as cryoprotectants, while some bacteria accumulate amino acids in response to osmotic stress. These may play a role in freezing tolerance. Proteins with antifreeze activity have been isolated from bacteria. In the early 1970s, it was discovered that some bacteria associated with the surface of decaying vegetation have strong ice-nucleating activity, seeding ice formation at temperatures as high as — 1 °C. These bacteria have proteins associated with their outer membranes which act as a template for the formation of ice crystals. A variety of ice-nucleating bacteria, particularly from the genus Pseudomonas, have been isolated. There are also some ice-nucleating fungi (Fusarium) and ice-nucleating activity is associated with the fungal component of some lichen symbioses. What advantage ice-nucleating activity confers on these microorganisms has been a matter of speculation. Since they are plant pathogens, seeding ice formation may damage the surface of the plant and enable the organisms to invade it. Nucleating activity may encourage the condensation of water onto the surface of bacteria that have been carried into the atmosphere and thus help them return to the earth in rain. The ability of these organisms to survive freezing may be assisted by ensuring that the plant tissues with which they are associated freeze at a high subzero temperature. By encouraging the freezing of plants, ice-nucleating microorganisms are responsible for substantial amounts of frost-related crop damage in freezing susceptible plants. Conversely, they may aid the survival of freezing-tolerant plants by ensuring freezing at high subzero temperatures and thus preventing intracellular freezing. Both ice-nucleating bacteria and fungi have been isolated from the guts of insects and freezing-tolerant frogs. For a freezing-tolerant animal, the presence of these microorganisms may assist survival by producing freezing at a high subzero temperature, but, for a freeze-avoiding animal, they would be harmful since they would prevent supercooling. This may be part of the reason why some freeze-avoiding insects empty their guts during winter.